Richard Parks' short stories have appeared everywhere from Amazing SF to Asimov's and Realms of Fantasy. "The Ogre's Wife" won the SF AGE Reader's Poll for short story back in 1995. "Golden Bell, Seven, and the Marquis of Zeng" from Black Gate #1 was reprinted in David Hartwell's Year's Best Fantasy Vol. 1. He's had stories on the Honorable Mention list in both Gardner Dozois' Year's Best SF and the Datlow/Windling Year's Best Fantasy and Horror. While Parks may primarily be considered a fantasy writer, he has also published science fiction and horror on a regular basis. His most popular recurring character is Eli Mothersbaugh, a high-tech ghost hunter based in the sleepy -- and oft haunted -- imaginary town of Canemill, Mississippi. Parks currently lives and works in Ridgeland, Mississippi with his wife, but can sometimes be seen haunting some of his favorite science fiction and fantasy conventions when he's not writing stories. K. Mark Hoover: When did you first begin to write? What motivates you? Richard Parks: I've been telling myself stories as long as I can remember, though I didn't start writing them down until high school. As for motivation, I'm not sure I have any. What I have is much closer to an obsession. Actually, I was always a writer, it just took me a while to figure that out, and even longer to develop the tools to practice the craft. KMH: You seem very comfortable working in the fantasy genre. What specifically draws you to it? RP: I've always believed the story chooses its own form, and I've learned to follow wherever that leads. That said, at heart I'm a fantasist. I enjoy the mythic, timeless mindset I'm in when I'm writing in that mode. At its best, fantasy reaches down deep into humanity's collective soul and shows us aspects of ourselves we all recognize. KMH: When you sit down to write do you purposefully plan to write a fantasy or a science fiction story, or do you just let instinct take over? RP: Most of the time I don't plan genre at all because there's no point; when the story notion comes together it brings its own setting with it as part of the package and there's no separating them. At that point it's just up to me to write it the best way I can; the rest is out of my hands. KMH: Is that a basic tenet? RP: There are exceptions. For example, "How Konti Scrounged the World" (Realms of Fantasy, Feb. 2000) came about because I like creation myths and I thought it might be fun to write one. So the glib answer is "both" but that's over-simplifying things greatly. I seldom sit down with the notion that "today I'll write a horror story" or whatever; that's happened so few times that the exceptions tend to stick out. KMH: Do markets for fantasy fiction take a backseat to those for science fiction? RP: There's always been more of a market for short science fiction than short fantasy, and writers and fans have been arguing the whys of that for years. I do know that fantasy magazines tend to have very short lives. Realms of Fantasy is a welcome exception to that rule. And, at novel length, fantasy is in the ascendant at the moment and outsells science fiction by a substantial margin. KMH: So where is fantasy going as a genre? RP: Fantasy and myth-making is something the human race has done since day one. I'm not very worried about its future as long as we have one. On the commercial side there's way too much generic "product" around, but every now and then you see a glimmer of hope, as when Phillip Pullman's work appeared. There's still room -- if not a lot of room -- for the lone idiosyncratic voice. As long as that's true I think the genre has a chance. KMH: Recently, a juvenile fantasy book (Harry Potter and the Goblet of Fire) won the Hugo Award for 2001. Then came the backlash. As an accomplished fantasy writer, do you feel this was a backlash against fantasy itself, or just the book? RP: There's always a bit of second-guessing on the Hugos, but, yes, in this case I think the fact it was a) fantasy and b) a "children's book" contributed to the controversy. The book's quality aside, the Hugos are a fan/reader popularity contest and, under the rules, Harry Potter was eligible and won. I think the real problem is that only a relatively small percentage of the WorldCon membership bothers to participate. Therefore it only takes one motivated voting block to skew the results. KMH: You once mentioned that HWA is not as influential as it once was. What brought this about? And if that's true, should a writer bother becoming a member? RP: A lot of it is due to the market; horror has been in a major slump for several years, though there are signs of improvement. If you write horror you'd join them for the same reason you'd join in better days: support, networking, market reports and warnings. In that respect HWA is still the best game in town. KMH: Let's move on to your writing style. You have a remarkable gift for portraying truly despicable characters in your fiction. Where does that come from? RP: From the same place my saints and heroes and everyday folk come from. The thing to remember about despicable people, as distinct from garden-variety psychopaths, is that they don't think they're the bad guys. They're just being human, and tapping into the almost limitless human capacity to find good, solid reasons to do the worst things imaginable. Real people are always more interesting than your standard Dark Lord. Maya Angelou once said, "I am human, and nothing human can be alien to me." That's the key. KMH: Eli Mothersbaugh is one of your most famous recurring characters. How did he get started? RP: Eli is a ghost hunter in a near future where the existence of ghosts is a proven fact and the nature of ghosts is a respected field of scientific study. His first appearance was in "Wrecks," which was published in the second issue of the British magazine, Odyssey. I wrote that story after a visit to Natchez, Mississippi, where my wife and I encountered ghostly legends that had attached themselves to antebellum mansions. KMH: Was it planned as a series from the beginning? RP: No, but the notion lent itself to more and more stories. "The God of Children" was published in Asimov's in December, 2000 and made the Locus Recommended Reading list. The third as "A Respectful Silence" which appeared in Realms of Fantasy, in the December 2001 issue. There's at least one more in the works. KMH: When you look over your body of work, where does it stand thematically? RP: In his introduction to The Ogre's Wife, my first collection of stories, Parke Godwin says my themes are ". . .the nature of our humanity and the inescapability of what we are, the choices we make and the price we pay for each, right or wrong." I'd say that's fair. KMH: What genres and authors do you like to read? RP: One of the many drawbacks of being a writer is that your time for reading for pleasure becomes extremely limited. When I can, I read Peter Beagle, Parke Godwin, Jonathan Carroll, and Ursula K. Le Guin. Jeffrey Ford's doing some interesting work. I've always been an eclectic reader, though, and for sheer fun I sometimes turn to manga. I think Takahashi is one of the finest storytellers working today, in any medium. KMH: Which leads me to my next question. Do you see yourself as a writer, or as a storyteller? KMH: Okay, let's be more specific. What difference is there between the two? RP: Well, storytelling in one aspect is strictly a verbal art, and that's not what I do. It's a separate skill. Yet my own interests, and that of the writers I most admire, are in the story aspect of fiction. I happen to think good characters, well-drawn settings, and good writing are essential to story, and not just ends in themselves. KMH: What's an ordinary writing day like for you? RP: That implies there is one. With short fiction I tend to "burst write," that is, a period of very intense work followed by days of no visible writing activity at all. When I'm working on a novel, by contrast, I come home in the evening, cook and/or have supper, then go into the library to write. KMH: So you don't write every day? RP: As in put words on paper? No, I don't. There are times I rest, and do nothing at all, yet even then the downtime is either preparation for writing or resting between bouts, or doing research for the next project. The sad truth for any working writer is there's really no such thing as downtime; it all serves the work in one way or another. After the worst fight my wife and I ever had, she nailed me to the wall with one unarguable truth: "At least you'll probably get a story out of it." I did. KMH: Do you enjoy writing, or is it something you instinctively feel you have to do? RP: Both. It helps to love it, but I've found that obsession will always pitch in when enthusiasm fails. I believe I have stories to tell, stories that won't be written unless I write them. I've tried writing and I've tried not writing, and what I've learned from that is I'm a better person when I'm writing: saner, happier, less of a trial to my wife and associates. When I write I become more than I am. There's a sort of magic that happens during the writing process. When a story is working, when the words flow and I make that connection, what comes out on the page is smarter, more profound, and wiser than. . .well, I am. KMH: What's the easiest thing about writing for you? RP: Dialogue. Get two interesting characters talking to each other and the scene will practically write itself. RP: Starting. Putting the first words of a new story on the screen. After that, it gets easier. KMH: What do you like most about writing, if anything? RP: Absolute favorite? The act of creating something new, a story that no one ever read before and never would have if I hadn't done the work. That's an incredible ego trip, to do work you consider worthy of someone else's time. KMH: And on the flip side. . . .
RP: There are so many candidates: poor markets, clueless reviewers, copy editors who can't, and the waiting we're constantly forced to do on submissions and revisions. KMH: What do you feel are your innate strengths and weaknesses as a writer? RP: I think I do characters fairly well. Even the despicable ones are worth hanging out with for a while. Questions of talent and technique aside, my main strength is persistence. I sold my first professional story to Amazing SF back in 1980. I didn't sell another one at that level for thirteen years. My one weakness is plotting. I'm constantly working on that. Storyline is easy, but the nitty-gritty details of getting from point to point are a trial. KMH: You once told me a writer must develop a "rhino's hide" when it comes to dealing with rejection. How do you personally deal with discouragement? RP: Getting rejected is never going to feel good. It just hurts more when you're starting out because the reality of having your work rejected is fresh, vivid. Your ego is at its most fragile. After the hundredth time it doesn't hurt so much. After the thousandth time it doesn't rate much more than a shrug. You hear of beginning writers who constantly polish and rewrite the same piece until it's "perfect." This isn't perfectionism. This is fear of rejection. KMH: How do you mean? RP: They avoid submitting the work for as long as possible and all they usually accomplish is to rewrite and rethink until they've squeezed out what little life the story had. You always learn much more from writing something new. KMH: If that's true, do you think writing is an innate skill, or can it be learned by anyone? RP: Almost anyone of normal intelligence can acquire the basic tools of good grammar, vocabulary, etc. Then again, owning a hammer doesn't make me a carpenter. Writing is one of those avocations that at once seems mysterious and arcane -- and yet nearly everyone thinks they can do it. But it doesn't work that way. You can't teach someone how to have something to say, or to recognize a good story when they see one. That part is a gift, and you either have it or you don't. KMH: Where does teaching fit in, if at all? RP: I don't dismiss teaching. Workshops like Clarion do a great deal to help give direction, structure, and discipline to people with the raw talent to become writers. However, it doesn't make them writers. The bottom-line cliche is "writing can't be taught, but it can be learned." I tend to agree with that. KMH: Current wisdom holds that a writer has not "arrived" unless he publishes a novel. Why is so much weight given to novels when genre fiction is driven and evolves in the crucible of short stories? RP: At least some of it is based on visibility and perception. Short stories tend to appear in magazines and anthologies -- collective works. Magazines don't stand or fall on one story, and their editors can take chances on quirky stories and odd perspectives that would be a much tougher sell at novel length. A novelist takes the greater commercial risk. It's his name on the book, and its success or failure adheres directly to him no matter what the publisher does right or wrong. KMH: How hard should a writer try to snag an agent? RP: I assume you're speaking about novels here. More and more now publishers are relying on agents to screen writers for them, and essentially take over a great deal of what publishers used to do in reading slush. One result is that, in my opinion, it's harder than ever to get a good agent, and there are a horde of bad ones out to fleece beginners if they're not careful. That doesn't mean you shouldn't try, so long as you keep in mind that the object is to sell the novel and establish a career. KMH: What are your views on multiple submissions? RP: There's nothing wrong with querying all the agents/publishers who interest you and you believe might be appropriate for the material; it would be silly to do otherwise. I would never, under any circumstances, do simultaneous submissions in short fiction. It makes no sense, and you run the very serious risk of annoying the editors if, not unheard of, more than one wants to buy the story. KMH: What about multiple submissions to the same market? RP: You're already competing with all the other writers who submitted that month; why compete against yourself? It also makes you look like you have no confidence in your work. It doesn't make a good impression. KMH: I know you attend conventions when possible. Which ones are your favorites? RP: I attend DeepSouthCon when I can, but my favorites are World Fantasy Con, Conestoga, and WorldCon. There really aren't too many conventions within easy travel in the South as opposed to other parts of the country. Most media conventions don't hold much interest for me. I'm a print chauvinist when it comes to SF and fantasy. KMH: Well, let's get into that. Print markets are dwindling in readership and subscriptions. What future do you see for them? RP: I'm guardedly optimistic they'll be around for a while. The thing is, I started writing seriously about 1976, and I can't recall a time when the fiction magazines were in good shape. When I started out my personal Mecca was Fantastic Stories, and it probably never had a circulation greater than 20,000. Whatever happens, I think there will always be writers who prefer the short form, and readers who will seek them out. KMH: It appears we've reached something of an equilibrium regarding print and on-line magazines -- at least for the moment. Should a writer seek to be published in print before an e-zine? RP: Depends on which e-zine and which magazine, but in general, yes, right now any writer would do her career more good appearing in one of the major print magazines. There's a lot of interesting things happening online, and some very promising electronic magazines are trying to establish themselves. Only time will tell if they can compete with the traditional magazines in a meaningful way. For now, print still has the edge. KMH: Because it's more influential? RP: The reputation of any magazine, print or electronic, depends primarily on the editor's reputation and presence within the field. With the obvious exception of Ellen Datlow at Sci-Fi.Com, none of the e-zine editors have her sort of gravitas. Yet. Only time and survival will change that, but the burden of proof is on the e-zines, as it should be. KMH: Is that across the board, for all genres? RP: In the horror field the situation is a bit different. There, outfits like Gothic.Net have tremendous influence already, if for no other reason than lack of viable alternatives. KMH: Are editors too powerful? What I mean is, doesn't a writer lose some of her authority and independence as an artist when she has to depend on editors to decide which direction the field will take? RP: My personal opinion is that none of them have that kind of power these days. It was true once, when for a time John Campbell pretty much was the field and it was his way or the highway. Now the readership is just too fragmented and specialized for any one editor's taste to predominate. The best ones influence the direction of the field by their choices, true, but they're not dictating what the writers should write except in terms so general as to be meaningless. KMH: Have you had any personal influences that shaped your career as a writer? RP: On a professional level the single greatest one is probably Parke Godwin. He was the first writer I ever communicated with, and he treated me like a colleague from the beginning, even when I didn't deserve the term. I'll always be grateful for that. KMH: Are you where you want to be, the pace and placement of your career, as a writer? RP: Of course not. Few writers are, in my experience, no matter how well they're doing. What writers seem to lack in any great store is the ability to be content. Every time you reach a goal, there's always another one. KMH: What are you working on now? RP: I've been revising the latest Eli Mothersbaugh story into a novelette. Also, I've been assembling my first collection, The Ogre's Wife and Other Fairy Tales for Grownups, for Obscura Press. I won't believe it's all real until I see it in print, which should be in time for ConJose. KMH: Any future projects in the works? RP: I sincerely hope so. There's always the next story, come what may, and I've got a couple of novel projects in mind. KMH: What goals do you set for yourself as a writer? RP: Simple survival. <grins> Despite my relatively low profile I've been doing this for a while. I've seen numerous examples of writers who publish a few dozen stories or a couple of novels and then disappear forever. Whatever I do, whatever venues my work appears in or how well known I become or obscure I remain, I intend to keep writing and publishing. I'm in this for the duration. K. Mark Hoover is a writer living and working in Mississippi. He is also the contest administrator for the Moonlight & Magnolia Fiction Writing Contest. He has published about a dozen short stories and articles in professional and semi-professional magazines; his previous publications in Strange Horizons can be found in our Archive. He has a wife and three children. 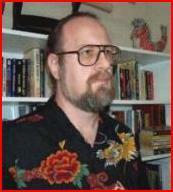 Kenneth Mark Hoover has sold almost forty short stories and articles to professional and semi-professional magazines. His first novel, FEVREBLAU , was published by Five Star Press in 2005. He currently lives and writes in Dallas, TX. Mark's website is http://kennethmarkhoover.com and his email is kennethmarkhoover@sff.net.